Kenya has been re-elected to the 15-member African Union Peace and Security Council (AU-PSC), the country’s bid garnering 37 votes. “The Council requests the Commission, in cooperation with Member States, to urgently compile a continental list composed of a database of persons, groups and entities involved in terrorist acts, including FTFs,” the 15-member council stated in a communiqué dated November 23, 2018. “In the same context, Council calls on the members of the international community to share with AU Member States, the lists of persons, groups and entities involved in terrorist acts, including their nationals identified as FTFs,” PSC resolved at the time. 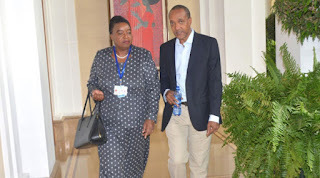 Kenya in December last year hosted the sixth continental peace and security conference, in what culminated into the adoption of next year’s programme for the AU-PSC. Kenya’s UNSC bid has already been endorsed by all the six member States of the East African Community. Namibia declared support for Kenya’s bid in October last year. “We’re hoping that we can get an endorsement at the AU level. If that endorsement comes through, the campaign will be very easy,” CS Juma had said in September last year. “If there’s anyone within our region who is interested in the non-permanent membership then we’re going to launch a global campaign,” she added.